Go anywhere at any pace with the highly maneuverable Summit X3 Double. All-wheel suspension and all-terrain tires mean your children will enjoy the ride as much as you do. The Summit X3 Double lets you go everywhere, even through a standard size doorway. Welcome to the Fold™ - Lift the straps and the Summit X3 folds itself: simply and compactly. It really is as easy as it sounds. Brakes - The Summit X3 was engineered with active parents in mind. Our unique hand operated rear drum brakes offer increased control even in the most pressing situations. Wheels - Straight dash or casual stroll, the Summit X3 Double offers a remote lock on the handlebar that lets you to toggle between swivel mode and a locked position for the front wheel with the flip of a switch. All-wheel suspension - Traveling over rough terrain is never a problem. The Summit X3 has an independent all-wheel suspension that offers the smoothest ride around. Seat - This seat was built for comfort. It reclines to a near flat position with vents and a retractable weather cover to make sure that your child is comfortable and safe while you stroll. Canopy - People love our SPF 50+ sun canopy because it really throws a lot of shade on a sunny day. It has two peek-a-boo windows so you can check on your little one and the canopies can be independently adjusted to multiple positions as you open or close them. Side vents provide ample air circulation to keep your child comfortable when it’s hot out. 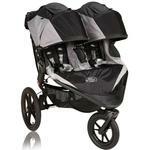 Travel System - The Summit X3 Double can become a travel system in a heartbeat using the Compact Pram. Twins? You can add either one or two Compact Prams to handle even the littlest of passengers. (Compact Pram sold separately). Dimensions Unfolded: 43" x 32" x 40"
Dimensions Folded: 33.5" x 32" x 15.5"
Our Baby Jogger Carry Bags make carrying or storing your Double stroller as convenient as possible. The Baby Jogger Carry Bags are made with specialized storage compartments for your wheels, durable fabric and a sturdy carry strap. Available in black only. The Summit X3 Double Belly Bar gives your child a safe and comfortable area to hold on to while strolling. 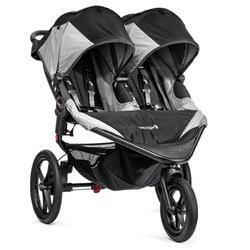 It adjusts at the push of a button and has a machine washable cover to make it easy to keep clean.The Baby Jogger summit x3 double belly bar spans across both seats of your summit x3 double and provides seated children with a soft padded area to hold on to when the stroller is in use. It can be adjusted with the push of a button for the height of your children and opens on one side to provide easy access to seated children. 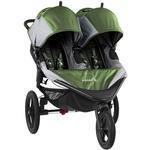 Compatible only with the summit x3 double stroller - will not work on other Baby Jogger models. The Baby Jogger Foot Muff helps to keep your little one warm. The fleece lined Foot Muff fits perfectly into the seat of your Baby Jogger stroller and provides a warm cozy place for babies to relax. Suitable from birth to approximately 24 months. This model is not compatible with the City Select - please order the Foot Muff specific to the City Select for an exact fit. The Baby Jogger Child Tray features a convenient baby cup holder and a durable easy to clean surface. This tray is compatible with the City Mini, City Classic, City Elite, City Select and Summit 360 strollers.